On January 30th and 31st 2017, the MEX and CESAR teams observed and recorded an auroral burst over Kiruna, Sweden. It was possible thanks to the Mars Express Science Working Team and Science Operation Working Group meetings celebrated at the Swedish Institute of Space Physics in Kiruna on January 31st and February 1st, 2017. Auroras are produced when the Earth magnetosphere is perturbed by the capture of the charged particles (mainly protons and electrons) that constitute the solar wind. When the particles enter in the atmosphere they collide with the existing gases (mostly Nitrogen and Oxigen) and excite the atoms that later reemit the absorved collision energy. The dynamics of the light emission depends on the magnetic interaction between both the Earth magnetosphere and the particles. 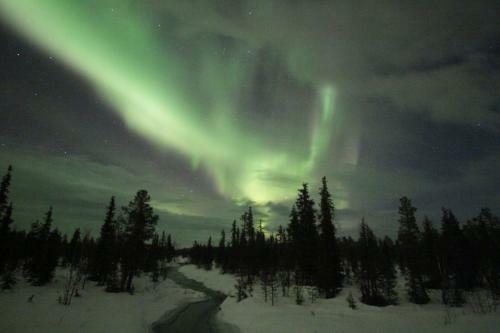 As the particles are captured mostly through the magnetic field poles, the auroral lights are seen at high latitudes of northern and southern hemispheres. The solar wind stream depends on the solar activity cycle of 11 years. So, when the solar activity is high it is more probable to see auroras because there are more intense particle ejections. Currently the Sun is moving to the minimum of the present solar cycle, so the solar mass ejections are not very intense. However, other solar features release significant streams of charged particles. The Sun corona acts as a shield that decelerates and reduces the solar wind normally ejected from the photosphere. As the corona is constantly changing and reshaping due to its interaction with the solar magnetic field, sometimes an area opens in the corona, then a coronal hole is formed. As a consequence the solar wind increases significantly and it is followed by intense auroras around the Earth poles. 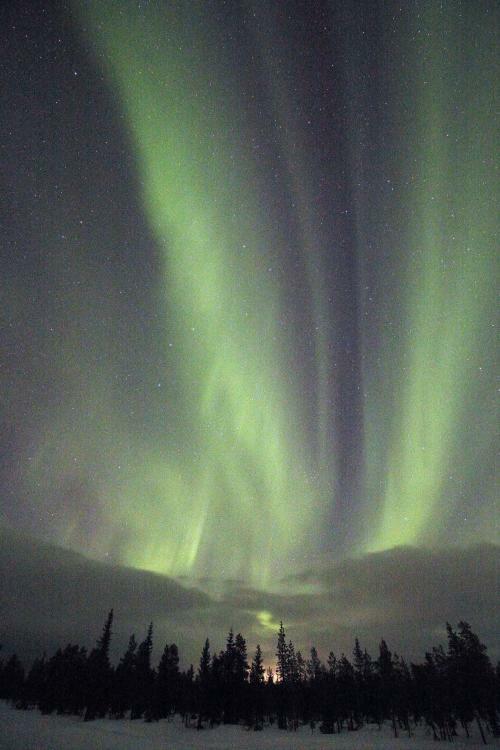 The observed auroral burst was produced by a G1 (Kp5) geomagnetic storm due to the arrival of a high speed solar wind from a large coronal hole in the Sun. This coronal hole can be observed in the following video of the Solar Dynamic Observatory of NASA. It formed behind the Sun and when it rotated and pointed to the Earth it released the charged particles that three days later produced the observed Auroras. The following video shows the observed auroras in real time.